Bluestone Capital Ventures (BCV) teamed up with the Cronulla-Sharks Rugby League Football Club in an effort to provide a high profile $300+ million redevelopment of Toyota Stadium, a town centre and residential complex within the Sutherland Shire. 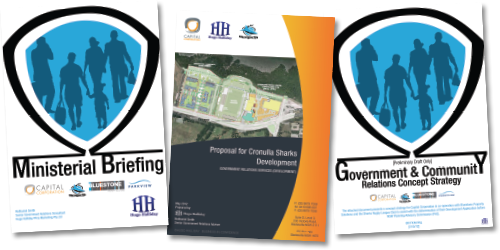 This development saved the Sharks!! 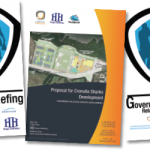 Hugo Halliday developed a successful Government & Community Relations strategy that ultimately helped to achieve approval of a proposed master plan by the Planning Assessment Commission (PAC). This project had stalled for several years, and Hugo Halliday helped to ignite Government and community support. This project is leading the way for rugby league and other clubs to raise revenue without dependence on gambling and alcohol.